As the profile of disability sport has risen, so has the emphasis grown beyond participation to include the development of a high performance environment. 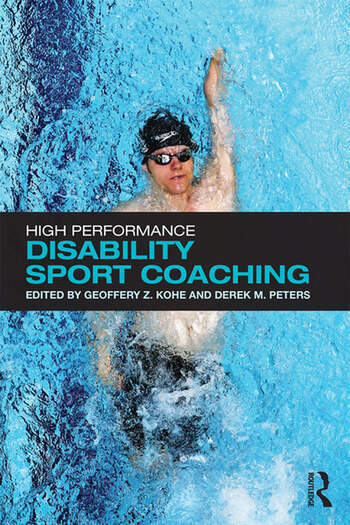 This book is the first to take an in-depth look at the role of coaches and coaching in facilitating the professionalisation of disability sport, in raising performance standards, and as an important vector for the implementation of significant political, socio-cultural and technological change. Using in-depth case studies of elite disability sport coaches from around the world, the book offers a framework for critical reflection on coaching practice as well as the reader’s own experiences of disability sport. The book also evaluates the vital role of the coach in raising the bar of performance in a variety of elite level disability sports, including athletics, basketball, boccia, equestrian sport, rowing, soccer, skiing, swimming and volleyball. Providing a valuable evidence-based learning resource to support coaches and students in developing their own practice, High Performance Disability Sport Coaching is essential reading for all those interested in disability sport, coaching practice, elite sport development and the Paralympic Games. Geoffery Z. Kohe is a Senior Lecturer in Sociology and Sport Studies at the University of Worcester, UK. His research, which sits within the Sport, Exercise and the Body Research Interest Group, is in the areas of sport organisational politics, young people’s experiences of Physical Education and the Olympic movement, and the socio-historical aspects of sport and physical cultures. He has recently published work in the International Journal of the History of Sport, International Review for the Sociology of Sport, Sport, Education and Society, and the Journal of Sport & Social Issues examining Olympic legacies, sport and Physical Education policy. Derek M. Peters is Professor of Sport, Health and Exercise Science at the University of Worcester, UK; Professor II in the Faculty of Health and Sport Sciences at the University of Agder, Norway; a Fellow of the European College of Sport Science; and a Level 5 Academic Expert Sport Performance Analyst. His interdisciplinary research expertise traverses a number of fields within and across sport, exercise, health and wellbeing. His recent projects have included work on elite sport training and performance, physical activity and health measurement, psychological and social behaviours, occupational health, and sport performance analysis.